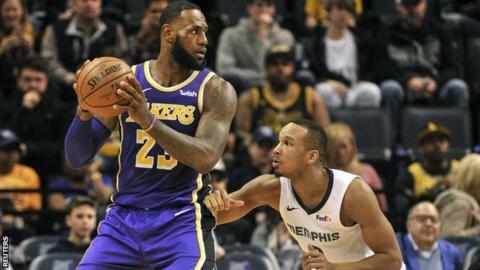 LeBron James became the first player to feature on the NBA's top 10 all-time scoring and assists lists in the LA Lakers' 110-105 defeat by Memphis Grizzlies. Already the fifth highest scorer of all time, James, 34, moved into 10th place in assists with 11 on Monday night. With 24 points and 12 rebounds he also registered his 79th triple-double to move up to fifth on that list. But James criticised his team-mates after a 31st loss of the season. "The last few years, everyone's so accustomed to the losses that I'm just not accustomed to," said three-time NBA champion James, who joined the Lakers last July despite the team having failed to reach the play-offs since 2013. "I would never get comfortable with losing. If you're still allowing distractions to affect the way you play, this is the wrong franchise to be a part of and you should just come in and be like, 'Listen, I can't do this'." Elsewhere, James Harden ended his 32-game streak of scoring at least 30 points as he finished with 28 in the Houston Rockets' 119-111 win against the Atlanta Hawks. It is the second longest run of games with 30 or more points in league history behind a 65-game streak by Wilt Chamberlain. "It was cool but I knew I wasn't going to get to number one," Harden said.